LASIK surgery makes use of the latest technological advances to correct a number of vision impairments. The surgery itself typically lasts just a few short minutes, and is performed on an out-patient basis. One of the biggest concerns that patients have about their LASIK procedure relates to the recovery process. While each procedure is different, and your eye’s responsiveness may vary based on factors unique to you, the visual results from your LASIK procedure are typically rapid. The majority of patients report that they are able to see nearly 20/20 just a few short minutes after their procedure; patients will see further vision improvements in a few days post surgery and can continue to see improvements over the course of several months. 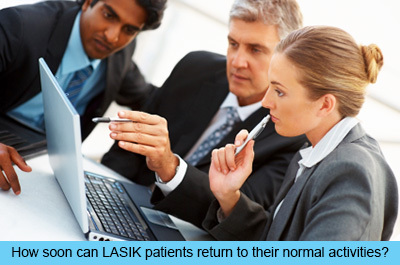 Following the procedure, LASIK patients can expect to resume normal activities the very next day after their procedure. There are of course just a few restrictions that need to be abided in order to ensure that the recovery process goes as smoothly as possible. While there will very possibly be an almost immediate improvement in patient vision, patients should not drive themselves home after their procedure. Their vision may still be fluctuating, and blurriness may be experienced; which would definitely pose a safety concern for someone who is behind the wheel. Protective eyewear should also be worn immediately following the surgery, in order to protect the irritated corneas from the direct sunlight. In fact, many surgeons ask their patients to keep their eyes closed for the entire day post surgery, and only open their eyes to use the restroom and to eat their meals. Taking a bath or a shower is typically not a problem, but patients are still urged to avoid getting water in their eyes for at least a week following the surgical procedure. Swimming in a pool or in the ocean is definitely not recommended, as this will simply increase the odds of exposing your eyes to the water and chemicals in a swimming pool. Swimming is not advised for at least 2 months post surgery. LASIK surgery will not keep you out of the gym for long. All physical activities can be resumed the very first day after surgery, including workouts. Patients recovering from LASIK are however advised to wear a sweat band in order to keep sweat from inadvertently running into their eyes during their workout. The vast majority of patients will be able to resume regular activities at work, if their work duties will not otherwise interfere with the recovery of their eyes. As an example, if you work in an area where you will be exposed to high levels of moisture or the elements then you may be putting your healing eyes at risk of exposure to water or chemicals. If your job duties include a significant amount of driving then you may be able to resume work within 24 hours following your procedure; however, driving at night could result in halos around bright lights and a fair amount of blurriness. This means that you may want to avoid driving at night for at least a week post-surgery. LASIK patients will be able resume normal activities within 24 hours of the procedure, and can even return to running, playing tennis, or enjoying a hike. The only caveat is that protective eyewear should be worn in order to minimize the impact of the brightly shining sun on corneas that may still be a little bit sensitive. Some of the other guidelines that LASIK surgeons will provide to patients following the procedure could include the following. Avoid rubbing your recovering eyes. The majority of LASIK patients will experience some level of dry eyes following their procedure, and this can often last for up to several months after the surgery. Rubbing irritated eyes however will just increase the risks of damaging sensitive corneas. Be sure to avoid strenuous activities, as well as sports that may otherwise be considered to be contact sports. This could increase the chances of sweat getting into your eyes, or of dirt or other debris getting into your eyes and causing irritation. Do not apply any face creams or makeup to your face if it could potentially come into contact with your eyes. It is all too easy for lotions and makeup to get into your eyes and cause severe irritation to your healing eyes. Patients can resume wearing make up 1 week post surgery. Use only the artificial tears and medications that your doctor prescribes for your eye recovery. Avoid using over the counter eye drops unless your doctor has recommended it, or approved it as a safe practice. Recovery time can vary between patients, due to the fact that every person’s body and eyes will heal in a manner unique to them. Your recovery may be swift and completely uneventful, or your recovery from your LASIK surgery could have you experiencing a number of side effects, as a result of your eyes being slower to heal. Working closely with your LASIK surgeon and your optometrist will help you to ensure that your progress is being sufficiently monitored. It is vital that you carefully follow the recommendations of your LASIK surgeon in order to ensure that the outcome of your LASIK procedure is as successful as possible.